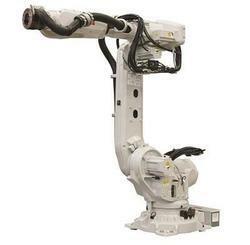 We provide complete solution of Welding Robot that is available in various sizes. These are used in the applications where human can’t do perfect welding for fixing and assembling various machines and equipments. These Welding Robots have salient features like high tensile strength, integrated with high technology equipments, corrosion resistance and high durability. 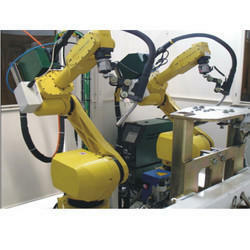 We provide complete solution of Welding Robot that is available in various sizes. These are used in the applications where human can’t do perfect welding for fixing and assembling various machines and equipments. These Welding Robots have salient features like high tensile strength, integrated with high technology equipments, corrosion resistance and high durability. We are engaged in offering industrial automation welding robot systems/welding robot/arc welding robot. Our products are fabricated using high-grade raw material in compliance with the set industrial quality standards. These robots are extensively used in various industries for precision welding purposes as a result of their null chances of error. You need to automate a process, a mechanism, a system or your entire production line. 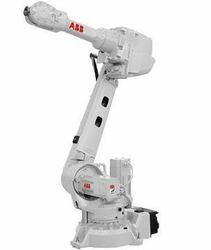 A new compact designthat offers a high payload capacity of up to 20kg and a working range optimized for material handling, machine tending and arc welding. It also offers the best accuracy and acceleration in its class, securing high output and low scrap rates for improved productivity. Flexible mounting possibilitiesincluding floor, tilted, wall, inverted or shelf mounted, which help to reduce floor space and increase access to the equipment being served. The wall mounted version has outstanding performance. These features enable more creative cell designs and enables floor space to be optimized in a wide variety of industrial segments and applications. Three versions two short arm variants (1.65m) for 12 or 20 kg payloads and a long arm variant (1.85m) with a 12 kg payload. Up to 27 kg payload is achievable for pick & place, and packaging applications, with the wrist held vertical. 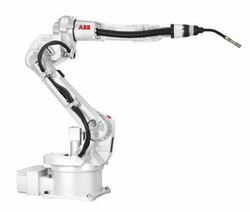 The IRB 6700 is more robust than its predecessor and maintenance has been simplified, making it the highest performing robot for the lowest total cost of ownership in the 150-300 kg class. The IRB 6700 family includes 10 variants, available as floor mounted and inverted versions. Looking for Welding Robot ?